The College Football Hall of Fame is an interactive museum dedicated to college football teams and players. There is an indoor football field guests can test their skills at, displays of team helmets, a fan experience theater and more. 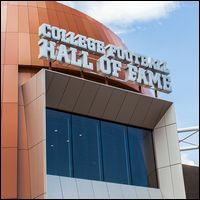 Parking: Visitors can park in the College Football Hall of Fame Parking Deck (GWCC Marietta Deck), which is connected to the Hall of Fame and accepts all major credit cards. Overflow parking is available in the Georgia World Congress Center’s Red Deck.